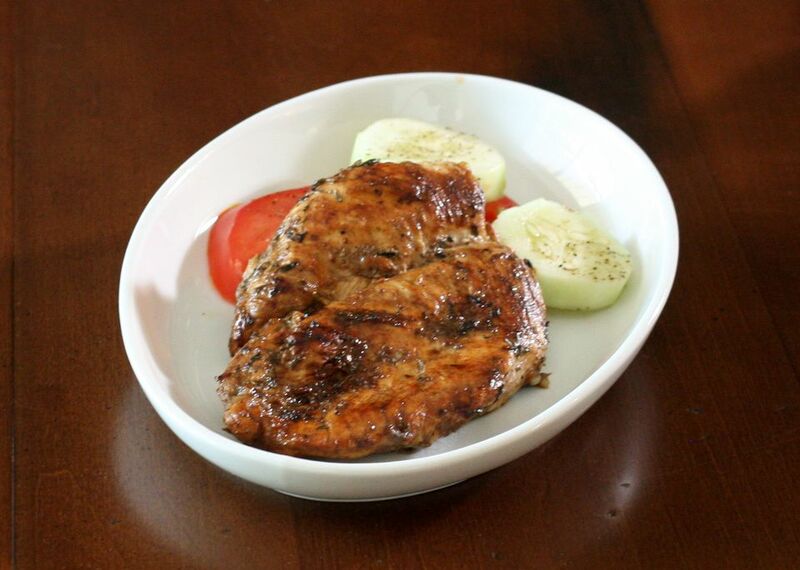 Balsamic vinegar, garlic, and simple seasonings give these grilled or broiled chicken breasts fabulous flavor. Serve this tasty chicken with sliced fresh vegetables or salad, along with potatoes or rice. Use chicken breasts or cutlets for this Mediterranean twist on a dinner-time staple. Put the chicken in a glass or plastic container or food storage bag. In a bowl or large measuring cup, combine the balsamic vinegar, olive oil, garlic, salt, oregano, basil, thyme and pepper. Whisk to blend. Pour the marinade mixture over the chicken and turn to coat thoroughly. Cover the container or seal the bag and refrigerate. Let the chicken marinate from 1 to 6 hours. (For oven broiling, skip to step 7) Grill the chicken on a grill or in a grill pan, turning to brown both sides until cooked through. Cooking time will vary depending on the thickness of the chicken. Standard chicken breasts will take about 6 to 8 minutes on each side, but thinner cutlets will take less time. When done, the chicken will register at least 165 F on an instant-read food thermometer in the thickest part of the chicken breast. To broil, line a baking pan with foil; spray with nonstick cooking spray. Arrange the chicken on the foil. Broil the chicken for 10 to 16 minutes, turning at least once during the broiling time (thinner chicken cutlets might take less time). Watch carefully and check for doneness with a food thermometer. It will register at least 165 F when the chicken is done.